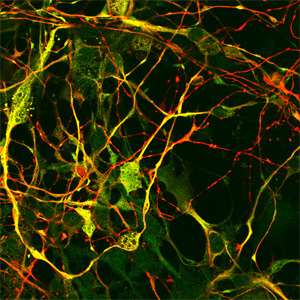 The center has established a variety of functional assays crucial to the study of neuronal communication in human neurons. These assays center around the question how neurons communicate in culture and how they transport information, in the form of chemical or electrical signals through and between the cells. The underlying postulate is that this communication is affected in the disease areas that this center studies. Fcondition that most resembles in vivo neuronal network. In addition, we can generate specific subpopulations of neurons, such as dopaminergic neurons, which comprise a minor population in the in vivo brain, to address specific questions pertaining to these subpopulations of neurons. urthermore we study Ca2+-dynamics in neurons and synapses using Ca2+-imaging in individual neurons. Using different microscopic techniques we can either zoom in into individual nerve branches or study (synchronous) patterns of activity in networks of cultured neurons. Heutink and Verhage (2012) Neuron 75, p935-8; PMID: 22998859.